Indian tennis stars Leander Paes and Mahesh Bhupathi, looking to improve on their performance in the singles, face an uphill task as they are pitted against tough opponents in their first round matches of the Tata Open 2002 commencing here tomorrow. Australia’s newly crowned world No 1 Lleyton Hewitt beat Roger Federer in a topsy-turvy men’s singles as the second-seeded home country toppled reigning champions Switzerland in the Hopman Cup tennis mixed teams competition here today. As a new year dawns, it will be interesting to see what it has in store for Indian cricket. I think it will be crucial for us to improve on our batting as it has not at all been consistent through 2001, especially in the latter half of the year. 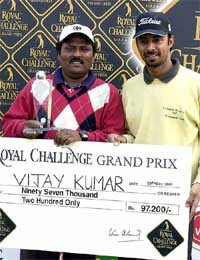 Winner Vijay Kumar and runner-up Jyoti Randhwa of the Royal Challenge Grand Prix at the Noida Golf club with the winner's cheque and trophy in Delhi on Saturday. —PTI Photo. The one-day series between India and England next month is not under threat following reports of a massive military build-up along India’s border with Pakistan but the players have been given an option to pull out if they so desire. Australia may throw the terror-spin twins Shane Warne and Stuart MacGill at the demoralised South Africans in Wednesday’s final Test at the Sydney Cricket Ground. Cricket Club of India (CCI) today beat Marylebone Cricket Club of England by 49 runs in the second match of the Spirit of Cricket festival triangular tournament played at the Brabourne Stadium here today. City’s Mahindra United hold a clear edge over former champions Salgaocar, Goa when the two clash at the Cooperage here. Mahindra United, who have two wins under their belt, look full of confidence with their forward Bala Usman and defender Musa Isa Eroje back in the team after serving a one match suspension. FC Kochin, after an unimpressive performance against ITI, losing 0-2 in the previous match, start as favourites in their home match against debutants Punjab Police in a Sixth National Football League match at the Jawaharlal Nehru Stadium here tomorrow. Former champions Mohun Bagan, stung by an ignominious 1-3 defeat against debutants Hindustan Aeronautics Ltd (HAL), have to improve their game considerably in their National Football league match when they take on ITI here tomorrow. The All-India Football Federation (AIFF) today adjudged Joe Paul Ancheri of Kerala as the ‘player of the year’ in the men’s section and O Bem Bem of Manipur in the women’s section after a meeting of the general body and special general meeting at the Jawaharlal Nehru Stadium here today. Some brilliant individual performances brought the country on the world sports map in 2001, a year in which Indian hockey showed bright signs of revival and cricket, for good or bad reasons, hogged the headlines. The feeble challenge of Centre of Excellence, Patiala, was brushed aside by Punjab Police 0-2 in the final of the 26th All-India Liberals Hockey Tournament that concluded at the Ripudaman College Grounds here today. Indian tennis stars Leander Paes and Mahesh Bhupathi, looking to improve on their performance in the singles, face an uphill task as they are pitted against tough opponents in their first round matches of the Tata Open 2002 commencing here tomorrow. As per the main draw, released at a simple function today, Paes will take on last year’s runners-up Andrei Stoliarov of Russia, ranked 84th in the world, while Bhupathi runs into Czech Jiri Vanek in the opening matches. Having earned wildcard entries to the main draw, the two, whose singles performance has left much to be desired, will have to bring out the best in them to advance in the seven day season opener. Top seed Guillermo Canas of Argentina will face Gorge Bastl (Sui) and the second seed Thomas Johansson will be up against Ivo Heuberger (Sui). In the doubles, the world No. 4 combine of Paes and Bhupathi, given the pride of the place in the seedings, is drawn to play against unseeded duo of Thomas Johansson (Sweden) and Andrei Pavel (Romania). Four other Indians are also in the doubles field as wild card entrants. Rohan Bopanna will combine with Spaniard Carlos Cuadrado while Mustafa Ghouse joins hands with Prakash Amritraj, son of veteran Vijay Amritraj. Prahlad Srinath combines with Ajay Ramaswamy. Though the Indians disappointed, failing in the singles qualifying rounds, Paes and Bhupathi are expected to keep the home crowd interest alive, having earned wild cards into the main draw. The event, being here for the sixth year, may not feature any reigning Grand Slam champions, but still some of the top international players will entertain the tennis lovers of the city during the next seven days. The tournament, which has got a new sponsor, suffered a setback when two-time French open winner Spaniard Sergi Bruguera pulled out due to injury along with Vladimir Voltchkov of Belarus. But, upcoming stars including Guillermo Canas of Argentina, No 15, top Swede Thomas Johansson, No 16, winner of Masters Series Andrei Pavel (Romania) and Slovak Dominik Hrbaty No 32 are sure to dish out some top class tennis. Tournament Director Sheila Maniam says the lineup for this year’s edition is the strongest in the last six years. Fabrice Santoro of France, who has won three singles and eight doubles titles, will be looking to start the new year with a win here. Big-serving Johansson will also be going in for the crown. He emerged as the top Swede in the ATP Champion’s race in 2001 and had won two back-to-back titles in Haile and Nottingham. Besides Paes and Bhupathi, the third wild card has been given to young talent from Austria Oliver Marach. Four qualifiers will complete the main draw of 32. The tournament carries a total prize money of $400,000 with a $54,000 purse for the singles winner who will also get 35 ATP race points. The finalist will get 24 points, the semifinalists 15 each and quarterfinalists 8 points each. Doordarshan will telecast the matches live. Hewitt, in front of a record crowd for the tournament of 8,486 at Burswood Dome, won a three-set thriller 6-3, 0-6, 6-4 in 97 minutes to defeat the 13th ranked Federer. Hewitt got home after his partner, Alicia Molik, scored a straight sets win over Miroslava Vavrinec in a women’s singles encounter. Molik, (20), ranked 47th in the world, beat the 23-year-old Vavrinec (116th) 6-3, 6-4 in 72 minutes. As a new year dawns, it will be interesting to see what it has in store for Indian cricket. I think it will be crucial for us to improve on our batting as it has not at all been consistent through 2001, especially in the latter half of the year. Having said that, there is no arguing that Sachin Tendulkar, Rahul Dravid and VVS Laxman had a fantastic year. We must learn to win important games and have lost too many finals of late. There is no point in being a good performer, and the boys must now learn how to win games on their own. I want to see how Sanjay Bangar fares in the one-dayers. He seems to be a good prospect as he seems to suit the role of the all-rounder, which is so important to the balance of the team. The Challenger series that will be played from January 10 to 12 will be a good test for him as he will be playing against top Indian batsmen. The Challenger series will also be interesting since the absence of Dravid from the side for the one-dayers against England puts the position of one batsman up for grabs. I am also looking forward to a significant contribution from Deep Dasgupta, especially since he has batted so well in the last two Test series. A keeper who scores runs regularly is bound to be an asset for the side, and it was an area in which we were falling short for quite some time now. If he and Bangar shape up well it will help the balance of the side no end. The other crucial phase of 2002 will be the tours to the West Indies and England. These will be opportunities for us to win series abroad, something we came close to doing in 2001, but were unable to pull off. We had our chances in Zimbabwe where we led 1-0 and in Sri Lanka, where we went into the third Test at 1-1. However, we had an inexperienced side in Sri Lanka and were not able to do well in the final Test. Our main target is the tour of the West Indies where we will be playing five Tests and seven one-dayers. The West Indians have regrouped well under Carl Hooper and are not a side that can be taken lightly at home. They were trounced 3-0 in Sri Lanka, but then, touring Sri Lanka is always tough and a reversal there does not mean the team does not have talent. It was good to see Brian Lara get back to form since he is a champion player. He has had a tough time these last three years and it is good to see him bat that way since he’s an absolute match-winner. “At the moment there is no reason to suppose that the tour is under threat,” the England and Wales Cricket Board Chief Executive Tim Lamb told BBC Radio Five Live today. “We would never knowingly send cricketers into an area of the world where they are at risk,” Lamb said. “Two or three months ago we were saying we had to monitor the situation in light of September 11 attacks and now we’ll have to keep a close eye on what is happening in Kashmir. Nasser Hussain, the Indian-born captain of the England cricket team, will be awarded an OBE (Officer of the Order of British Empire) in the Queen’s New Year’s Honours in recognition of his role in the revival of England’s cricket fortunes in the past two years. Chennai-born, 33-year-old, Hussain is widely regarded as the best strategist to captain England since Mike Brearle. Leg-spinner MacGill was today added to the Australian squad, which has been boosted to 13. Australia are chasing a 3-0 whitewash having secured the series with a nine-wicket win at the Melbourne Cricket Ground yesterday. “We’ve got the momentum going our way and we’ve got a good record in Sydney,” Waugh said today. “I don’t know what the wicket’s going to be like but I’d like to think there’ll be a bit of turn. The omens are there for two wrist-spinners to play in Sydney. So far Warne has taken 11 wickets in the series and MacGill claimed nine for New South Wales in the tour match against the Proteas here last week. MacGill is sure the SCG pitch will take spin and that he can operate in tandem with Warne. “The pitch I took nine wickets on against the South Africans at the SCG had no grass on it at all, but one thing I have found over the years is that it always turns at the SCG whether there is grass on the surface or not,” MacGill said today. CCI had yesterday lost by seven wickets to the Melbourne Cricket Club. Put into bat by the Marylebone Cricket Club, CCI amassed 266 runs for eight wickets in their allotted 50 overs, thanks to a superb century by Kiran More, who made 110 of just 104 balls with 17 boundaries and an impressive 86 by Yashpal Sharma, who hit six fours and four massive sixers. For Marylebone Cricket Club, Bradleigh Donolow captured three wickets. Chasing 267 for victory, the English side was never in the hunt and apart from David Ward who made 67 coming in one down, none of the batsmen could make much impact, folding up for 217 in 42.5 overs. Guru Nanak and Dilip Doshi each captured three wickets a piece. CCI: 266 for 8 in 50 overs (Kiran More 110, Yashpal Sharma 86; Bradleigh Donolow 3-61). City’s Mahindra United hold a clear edge over former champions Salgaocar, Goa when the two clash at the Cooperage here. Mahindra United, who have two wins under their belt, look full of confidence with their forward Bala Usman and defender Musa Isa Eroje back in the team after serving a one match suspension. Usman and the other striker Austin Akolo have been combining well and their mid-fielders S. Venkatesh, Khalid Jamil, Jules Alberto and Habib Adekunle have been a source of inspiration for the whole team with their fine interceptions and deft passing. International Virendra Singh is their goalkeeper while Anthony Pereira, Tapan Ghosh, M. Suresh or Jeevan Moras will do duty in the defence. Salgaocar’s number one custodian is Kalyan Chaubey while their defence consists of Franky Barretto, Robert Fernades, Nigerians Bolaji Molubiyi and Bello Razak. They have Climax Lawrence, Eugene Gray, Dharamijit Singh and Denis Cabryal in the midfield while their two strikers Glador Oscar and Alvito D’Cunha have been doing a good job so far. Salgaocar has seven points from four matches so far. The local outfit has two points from four matches (2 loss, 2 draw) and would certainly need a win tomorrow to get their campaign back on rails. On the other hand, the cops who had lost all their four outings so far, will go all out for their maiden win. The Kochin team showed signs of recovery after losing their opening match against Salgaocar 0-1 by carving out draws against JCT (1-1) and Kolkata giants Mohun Bagan (0-0) in their subsequent matches. But, in a disappointing result, they went down 0-2 to ITI in the previous match. The worrying factor for Kochin would be the lack of an experienced striker to support the speedy Liberian Josiah B. Seton. Adding to their woes would be the absence of playmaker Ukranian Mikola Shevchenko and medio Noushad, both of whom are out with two yellow cards. The defence manned by Nigerian Obinna Winners Onya, Martin Mathew and L. Suresh will have a tough time against the Punjab Police strike force led by Praveen Kumar, Manjinder Singh and Sher Singh. FC hope that Ghanian Ali Abubakar, yet to reach peak form this season, will regain his form in this crucial match. Former champions Mohun Bagan, stung by an ignominious 1-3 defeat against debutants Hindustan Aeronautics Ltd (HAL), have to improve their game considerably in their National Football league match when they take on ITI here tomorrow. Despite a flourishing start in the league, with a handsome victory over East Bengal, Bagan would have to recover from the defeat if they have to salvage their reputation and keep the battle for title hunt alive. The Kolkata giants have two wins and a draw besides the loss against HAL. The going is likely to be tough for them as ITI, with an impressive 2-0 win over FC Kochin in their previous encounter, are likely to put up a good performance. Their first three encounters ended in draws. AIFF secretary Alberto Colaco said both Ancheri and Bem Bem will be given cash prizes of Rs 15,000 each. This is the first time that a female player is being given the ‘Player of the Year’ award. Mr Colaco said the AIFF also praised the performance of the first female FIFA referee from India, Bentla D’ Couth. Mr Colaco said the second division National Football League would begin on February 15, 2002. The league will be played in three stages for 90 days. He said two teams each will be selected from those states where there are “very strong and competitive leagues”. Last year’s demoted teams will be directly seeded into the final phase. Two more teams will be seeded into the final phase, and four into the second phase. Mr Colaco said the teams to be seeded will be decided by the second division National Football League committee. The Under-21 National Football Championship will be held in April 2002, and the National Women’s Football Championship will be held at Mandya, Karnataka from February 15, 2002. Mr Colaco said henceforth, states desirous of holding the national football championships would have to submit proposals highlighting the facilities available. He said the competition committee would decide the venue after evaluating the proposals. He said the AIFF would also hold the Asian Football Confederation under-17 and under-20 preliminary round matches. The under-17 matches will be held from May 5, 2002 in which India, Maldives and Bhutan will feature. The under-20 tournament will be held from July 10 in which India, Kyrgistan, Tajikistan and Bhutan will participate. The venues will be decided later. Mr Colaco informed that the AIFF had accepted an invitation to participate in a four-nation tournament in South Africa in May. The AIFF also released the calendar for the year 2002. The National Football Championship for the Santosh Trophy will be held from October 15 to 31 in Manipur, while the first division national league (under-19) will be held from November 10. The Indian team will tour England in the last week of July and play in the Asia under-19 qualifying round from July 10 to 20. The Federation Cup will be held in the fourth week of March. Mr Colaco said players in the under-19 team will not be released during May, June and July. If India win in the Asia qualifiers. these players will be called for camps in August and September. There is a proposal to hold an inter-club tournament in January 2003. Controversies continued to dog Indian sports, especially in the latter part of the year, as the cricket team’s tour to South Africa saw acrimonious scenes that drew world attention. Earlier, the manner in which the Arjuna Awards were doled out created a stir with the legendary Milkha Singh refusing to accept the top sporting recognition. Also, reports that a large number of athletes used drugs to enhance performance kicked up a row. Twenty-one year after Prakash Padukone won the famous All-England Badminton Championship, Pullela Gopi Chand scored a spectacular victory at Birmingham to become the second Indian to claim the prestigious title overcoming Denmark’s P. Christensen and China’s Chen Hong. Rajiv Bagga,the only deaf player to have won the National Badminton Championship, was awarded the ‘Deaflympian of the Century award by the Comite International des Sports des Sourds (CISS). In tennis, Leander Paes and Mahesh Bhupathi sank their differences and revived their partnership. They opened their campaign with a style winning the French Open for the second time. Though they lost the Wimbledon and the US Open they proved that they were the best pair as they defeated American pair in the doubles of the Davis Cup. Evergreen Geet Sethi once again gave India yet another world title in billiards. The Indians dominated the world event held in New Zealand. Andhra’s 12-year-old chess prodigy Koneru Humpy did India proud by becoming the youngest Grandmaster in the world. Her statemate P. Harikrishna became country’s youngest Grandmaster. Vishwanathan Anand lost his world title though he won the Meinz Championship defeating Russian Vladimir Kramnik. Grandmaster K. Sasikiran won the AICF Golden Jubilee International Chess Tournament. However, tragedy struck the game as five young players from Andhra Pradesh died in a car accident. Anil Kumble became the first Indian spinner and second bowler to take 300 wickets. He earned this distinction in the third Test against England before home crowd in Bangalore when he had Matthew Hoggard leg before wicket. Master batsman Sachin Tendulkar crossed 10,000 run mark in limited overs and 7,000 in Test cricket. Laxman, who surpassed Sunil Gavaskar’s 236 — the highest by an Indian in Test cricket — went past his previous best Test score of 167 against Australia in Sydney early 2000. Punjab off-spinner Harbhajan Singh, who became the first Indian ever to take a Test hat-trick, spun his team to a 171-run win over the visitors with a rich haul of 13 scalps. It was a momentous year for Indian hockey. The juniors won the World Cup for the first time routing Argentina 6-1 in the final. India also qualified for the next year’s senior World Cup hockey and for Champions Trophy. They also won Champions Challenge Cup and Prime Ministers’ Cup at Dhaka defeating Pakistan. In car racing, Narain Karthikeyan won the Formula Three in Belgium and his compatriot Asif Nazir claimed Formula three championship in Japan. Indian shooters, including Abhinav Bindra, brought glory to India in the Commonwealth meet in Britain. India beat Japan but failed to get past the USA in the Davis Cup. Veteran weightlifter Kunjarani Devi tested positive for taking drugs and was deprived of the medal which she won in the Asian Championship in China. At home, in athletics, a 37-year-old national record was bettered. Twenty-year-old Gurpreet Singh rewrote Gurbachan Singh Randhawa’s 110 m hurdles record set in the Tokyo Olympics in 1964. He clocked 14.07 as against Randhawa’s 14.09 in the inter-state athletics in Lucknow. Kerala won the National Football Championship for the Santosh Trophy, but the game showed no signs of revival. Mohun Bagan won the Federation Cup defeating Dempo Club. Industrialist Vijay Mallaya threatened to start on parallel National League but the All-India Football Federation (AIFF) president Priya Ranjan Dasmunshi managed to ward off the threat. The jinxed Afro-Asian Games, which nobody but officials wanted, were postponed indefinitely due to security reasons. The much-delayed National Games were finally held in Punjab. They, however, failed to give any direction to the sports in the country. They were held just for the sake of it with its conducts left much to be desired. Hosts Punjab emerged overall champions. Flying Sikh Milkha Singh cried foul when he was awarded the Arjuna Award and created a lot of controversy. Sports, especially cricket, lost a great patron when former BCCI president Madhav Rao Scindia died in a plane crash. Indian cricket will remember 2001 as the year of tectonic upheavals that witnessed shocking decisions of ICC match referee Mike Denness sending the game into a tizzy and the “tigers” at home slashing Australia’s winning streak to clinch a Test series 2-1. After Bodyline, Kerry Packer and match-fixing, the cricket fraternity faced a major controversy following Denness’ obdurate decision of meting out penalties to six Indian players during the drawn second Test against South Africa in Port Elizabeth last month. Denness, who captained England and Kent, slapped a suspended one-match ban on batting maestro Sachin Tendulkar for “tampering with the ball” and sanctioned skipper Saurav Ganguly, Virender Sehwag, Harbhajan Singh, Deep Das Gupta and Shiv Sunder Das for “bringing the game into disrepute through excessive appeals”. However, the BCCI and the ICC sorted out the matter and crisis was averted. Besides, the Indian cricket board saw a coup when former ICC president Jagmohan Dalmiya turned the tables on incumbent A.C. Muthiah in the race for the BCCI chair, winning by a margin of 17 votes to 13. Mr Dalmiya retained team coach John Wright and physio Andrew Leipus till the next World Cup in South Africa. A thick veil of fog engulfed the playing arena even as hundreds of hockey enthusiasts braved the cold winds and chilly weather to watch the contest that barely rose above the level of mediocrity. Centre of Excellence was riding high on a wave of confidence having beaten many a fancied outfit in the run-up to today’s final. Punjab Police, had loads of experience and expertise to bank upon. The proceedings started on a sedate note with the cops forcing a series of penalty corners and off one such attempt the Patiala boys had a narrow escape when full back Jaskaran Singh faked an indirect penalty corner and put V.P. Singh in possession who had the misfortune of seeing his firm drive beat the custodian but the ball bounced back after hitting the far post. The inexperience in the ranks of Centre of Excellence was apparent as their star performer Deepak Thakur had to sit on the bench for the entire duration of the match since he was shown the yellow card twice in the team’s previous two encounters. With goalkeeper, Kamaldeep Singh, who is among the probables announced yesterday by the IHF for the World Cup, also not going all out fearing injury, the ploy of the Patiala boys was to survive the regulation time period rather than go all out for victory and then take their chances in the penalty shootout. Midway in the first half, the cops surged ahead through centre-half Sarabjit Singh whose goal was perhaps the best of the tournament. After skipper Prabhdeep Singh fed him with a diagnol pass from the right, Sarabjit hoodwinked the defenders but failed to control his momentum and rammed into the goalkeeper. However, he was quick to recover and dived full length attempting a reverse flick and the ball landed in from an acute angle. Sarabjit Singh not only added another goal when he scooped the ball into the net but was also instrumental in feeding his forwards with some incisive passes. The prizes were distributed by the Governor of Uttaranchal, Mr S.S. Barnala.